Topped by a fanciful, multi-tiered turret, the five-story “Casa Piccola,” where Leopold Guttmann’s flourishing business was located after 1902, was not “piccola” at all. Erected in 1896, the building retained the name of the structure that preceded it—the long-standing Café Casa Piccola founded in 1830 by one Dominik Casapiccola. 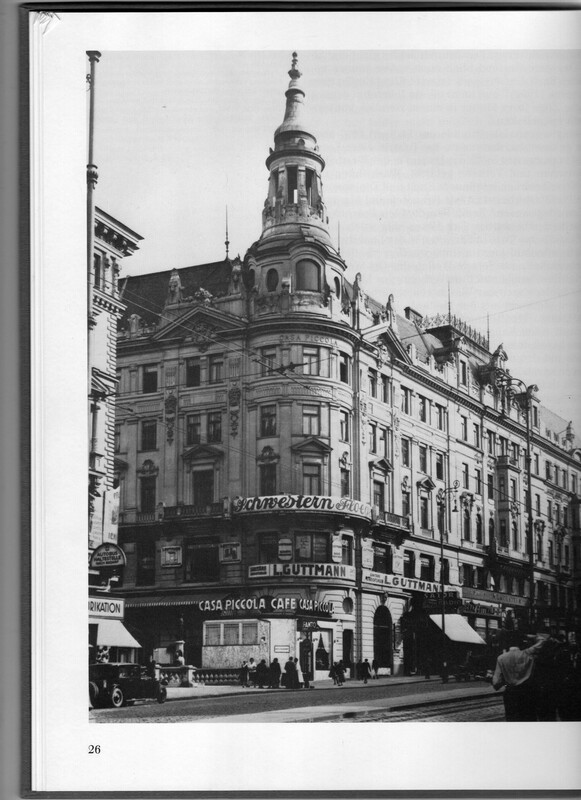 That café became a popular meeting place in Vienna for the Italian nationalists known as the Carbonari. Even then, apparently, Italian fashion exerted its charm and the Viennese were soon seen sporting the Carbonari’s characteristic multi-collared great coats until, by Imperial decree, the Emperor declared the nationalists, as well as their garb, symbols of subversion, and both were outlawed. The fin-de-siècle builders remained true to the tradition of the spot, and a new Café Casa Piccola was incorporated at street level. Like its predecessor, it began to have a special place in Vienna’s social life when it became a favorite watering hole for the admirers of the café proprietors’ youngest daughter—the fledgling actress Lina Obertimpfler. Among her suitors was the rising architect Adolf Loos. She married him in 1902. With the arrival of the third business tenant to the Casa Piccola in 1904—the dressmakers “Schwestern Flöge,” (Flöge Sisters)–an outpost of an artistic circle actively opposed by Adolf Loos had found its way to the Mariahilfestrasse address. Emilie Flöge, one of the three sisters involved in the enterprise, was the companion of the painter Gustav Klimt. He had been among the artists who helped found the very successful Vienna Secession in 1897. Inspired by this collective effort, a group of Secession artists and architects launched the “Wiener Werkstätte” (Viennese Workshops) in 1903. The venture was intended to link artists and craftsmen and give architecture and decorative arts the same modern momentum that had inspired the Secession. One of the Wiener Werkstätte’s first commissions was the design of the Flöge Sisters’ showroom in the Casa Piccola. Adolf Loos and myself—he literally, I in words—have done nothing other than show the difference between an urn and a chamber pot, and it is only this difference which allows culture to exist. As for the others, they can be divided into those who use an urn as a chamber pot and those who use a chamber pot as an urn. For most Viennese, the metaphor of the “chamber pot” used by Kraus to heighten the hyperbole would have cut too close to home. Just below the elegantly designed showrooms of the Flöge Sisters and just above the café belonging to Loos’s in-laws, great-grandfather Guttmann was, indeed, making “urns out of chamber pots,” not out of aesthetic choice but social necessity.